IPE programs serve prospective and current students, faculty and the larger community at IU and beyond, in order to build our intellectual and creative collective focused on the environment and sustainability. In addition to our established programs outlined here, we engage in special projects and collaborations as they arise from the grassroots of our diverse and expert affiliates. 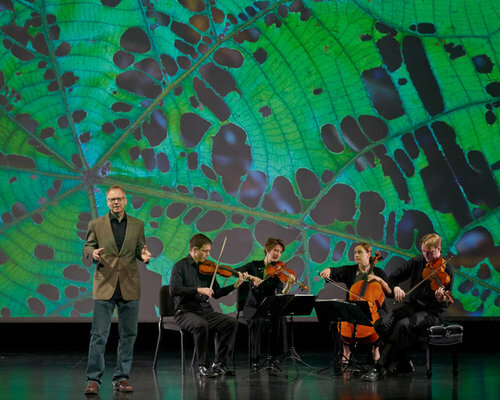 Through a New Frontiers grant from IU's Office of the Vice President for Research, IPE and ERI present a celebration of how the arts and humanities catalyze science in support of environmental sustainability. Events include an evening performance of "Rising Tide: The Crossroads Project," featuring physicist Rob Davies’ spoken word focused on the science of our existence on planet Earth, the musical performance of the Fry String Quartet anchored by a new work by composer Laura Kaminsky and movements from the great masters, as well as the projected images of painter Rebecca Allen and photographer Garth Lenz on the big screen at IU Cinema, a special Crossroads First Thursdays festival, and a day-long symposium with lectures, a workshop, and a panel discussion. Attendance is free and open to the public, although some events require advance registration.